In one sentence, Sessions turned “island” and “Pacific” into swear words, and expelled Hawaii from the United States. Presumably, for Sessions, had the judge been sitting someplace in the real world, someplace that matters, like St. Louis or Dallas, that might have been home to a more credible challenge to Trump’s travel ban. But an island in the Pacific? Contemptuous. Sessions’ sneering remark must feel familiar to so many Pacific Islanders whose lands and lives have been the playthings of imperial powers—especially the United States. It reveals an attitude which, in the shadow of the climate crisis, has genocidal implications. I spent this past week with Kathy Jetñil-Kijiner, a remarkable spoken word artist from the Marshall Islands, located in the Pacific Ocean about halfway between Hawaii and Australia. The Portland Public Schools Climate Justice Committee had hired Jetñil-Kijiner to perform her poetry and lead writing workshops with students and staff in Portland, Oregon, middle schools and high schools. Jetñil-Kijiner lost the high school History Project competition. When she performed her piece for Portland students, she acknowledged the poem’s sad and sudden end: “And I lost.” She noted that this conclusion underscores the enormity of loss in the Marshalls—no one will ever be able to live on radioactive Bikini Atoll; the carcinogenic legacy in the Marshalls is one of the worst in the world—and in her workshops, Jetñil-Kijiner asked students to reflect on the connection between nuclear testing and climate change. 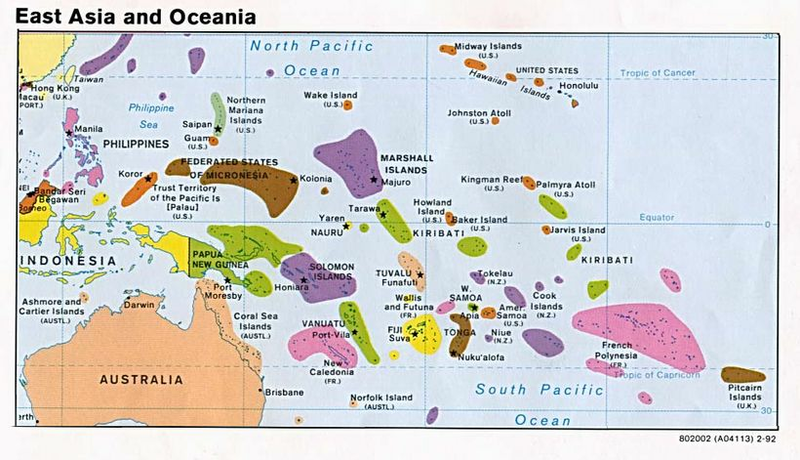 Map of islands in the Pacific Ocean. View larger image. Sessions’ flip dismissal of islands in the Pacific holds up a mirror to the Trump administration’s dismissal of climate change, which promises a future of rising oceans, devastating superstorms, and drought, with life-changing consequences for people in the Marshall Islands, Kiribati, Tuvalu, Niue, the Ryukyu Islands, and too many others to name. In fact, for many, this is not the future, this is the present. It’s why people in frontline communities demand a global commitment to policies that keep the climate from warming more than 1.5 degrees Celsius over pre-industrial times. Anything less ambitious is a cultural death warrant. Instead, Trump celebrates coal-burning, nominates a climate denial champion to head the Environmental Protection Agency, and threatens to pull out of the Paris Climate Accord. As Jetñil-Kijiner told students, “Every reef has a story, a chant, a song.” We are nothing without our islands. The writer Wendell Berry once wrote that social elites “cannot take any place seriously because they must be ready at any moment, by the terms of power and wealth in the modern world, to destroy any place.” In an unguarded moment on a conservative talk radio show, Jeff Sessions offered a perfect illustration of this insight. Pacific Islands? No one who matters lives there. People there are invisible—at least to Sessions and his ilk. Film about the U.S. government’s testing of nuclear weapons on the people of the Marshall Islands. Learn more. Bill Bigelow is curriculum editor of Rethinking Schools magazine and co-director of the Zinn Education Project. He co-edited A People’s Curriculum for the Earth: Teaching Climate Change and the Environmental Crisis. The Zinn Education Project is a collaboration between Rethinking Schools and Teaching for Change. Learn more about the Zinn Education Project and how you can help bring people’s history to the classroom. © 2017 The Zinn Education Project.